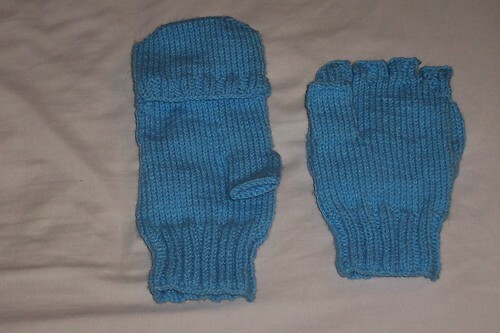 flip back gloves « T-Bird\’s crafty Blog! These are from a pattern off teh web (I’ll link if I remember where) however, the instruction layout was awful, half the instructions were in little “macros” at teh beginning rather than where they belonged which I found incredibly difficult to cope with but with much cutting and pasting I sorted it out and off we went. I did them on 2 circs rather than 4 double points and have to say it does make life easier. I did take some pics to show how but unfortunately didn’t quite realise that circular needles with pink cables really don’t show up well on a pink sofa so you still can’t see what I was doing!!! Doh! They were originally MIL’s Christmas pressie but a total lack of effort meant taht they only got finished today 🙄 so they will do nicely for her birthday next week instead! This entry was written by tbird and posted on 4 January , 2007 at 10:36 pm and filed under Uncategorized. Bookmark the permalink. Follow any comments here with the RSS feed for this post. Post a comment or leave a trackback: Trackback URL. Oh, don’t I know that present scenario! Thanks for the sleeve tips – I think I will have a bash at a few of the suggestions and am def. planning a yoked sweater (from the sweater book). ROFL Jax! Actually it may have helped if I had decided a bit more than 3 weeks before Christmas that this was what I wanted to do!!! Sigh, one year I WILL be organised! Dottyspots – I agree, girls are good for unleashing your creative side – I don’t think Aprilia ever needed to wear the same cardi twice until she was about 2 as so many knitters in the family/friends jumped at the chance to do pretty little things for her!